(Photo: Kim Cain)Crowd at a Christian Unity rally in Jakarata, Indonesia on May 18, 2013. 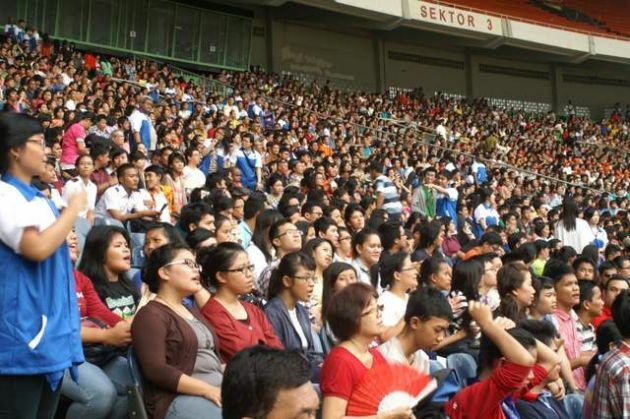 JAKARTA - In a first for Indonesia, the nation with the world's largest Muslim population, about 60,000 Christians from all major church traditions have gathered in a celebration of unity in the national sports stadium in the capital, Jakarta. It was a mass demonstration of Christian unity believed to be unique in Asia – and perhaps the world. The rally brought together people from seven different families of church traditions including Catholic, Evangelical, Orthodox, Pentecostal, Protestant and Salvation Army for the sole purpose of expressing Christian solidarity. The Jakarta event, which took place on the eve of Pentecost, on May 18 was instigated also as a way of welcoming the World Council of Churches to Asia ahead of its 10th Assembly to be held in South Korea later this year. One senior Asian church leader said prior to this event most other church gatherings were based on denominational celebrations and anniversaries, and often were mostly attended by church leaders. The spirited crowd included as invited guests leaders of the South Korean WCC general assembly organizing committee, led by Dr. Kim Samhwan, the general secretary of the WCC, Olav Fykse Tveit and the secretary of the Global Christian Forum, Larry Miller. (Photo: Kim Cain)Global Christian Forum secretary, Rev. Larry Miller, at a Christian Unity rally in Jakarata, Indonesia on May 18, 2013. Miller said the Indonesian churches were offering an example to the world, showing how church unity could be expressed in new, expanded and more public ways. 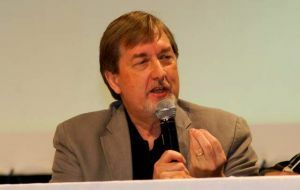 Miller noted that the Indonesian Christian Forum, which organized the event, was itself inspired by and formed during the GCF's second global gathering in the Indonesia city of Manado 19 months ago. "Now the Indonesian Christian Forum is welcoming the WCC to Asia, with a combination of churches whose constituency is much wider than WCC membership in Indonesia," he said. "This is a creative and memorable moment in the story of Christian unity." Adding to the matrix, Miller said it was former WCC general secretary, Konrad Raiser who gave impetus to the formation of the Global Christian Forum. It was 15 years ago, at the 8th WCC Assembly in Harare, Zimbabwe. There he called for the establishment of a new 'open space' where all churches ­- especially including those who were not members of the WCC - would be welcomed. "So in some ways, with this Indonesian event we have witnessed the completion of a circle of mutual welcoming and hospitality, one that includes the development of complimentary and cooperative roles for the GCF and the WCC in the journey of Christian unity - each one with gifts to share and ready to share them," Miller said. (Photo: Kim Cain)World Council of Churches general secretary, Rev. Olav Fykse Tveit with an interpreter, at a Christian Unity rally in Jakarata, Indonesia on May 18, 2013. A highlight of the Jakarta celebration was the lighting of a series of torches, somewhat reminiscent of an Olympic torch relay. The torches, lit from torch to torch by leaders of the seven different church traditions culminated in a flame of unity extending up into the night sky. The seven church families involved in the Indonesian Christian Forum, also includes the Baptist Church and the Seventh Day Adventist Church. (Photo: Kim Cain)Part of the crowd at a Christian Unity rally in Jakarata, Indonesia on May 18, 2013. A five point declaration of commitment made when the ICF was formed on the closing day of the GCF gathering in Manado, on October 7, 2011 was again pledged publically at the rally. Speaking at a 3,000 strong 'Celebration of Unity' seminar prior to the mass rally WCC leader Rev. Olav Fykse Tveit said, "Christian unity is a way of living together… It is not about being united by defining ourselves against something, but we live in a unity of faith that calls us to serve the whole world." Rev. Andreas Yewangoe, chairperson of the Communion of Churches in Indonesia reminded the crowd that "the unity of the churches is not because we declare it. "No, the unity of the churches is only possible because Christians are called to love one another," he said.